These days, quinoa is very popular and has been put in the new category of 'superfoods'. However, an interesting discussion has erupted about how healthy quinoa actually is. Quinoa is not a grain, although it is used in the same way. Quinoa is actually the seeds of the quinoa plant. This plant is a member of the family that includes spinach and beet, and its panicles come in a variety of colours. Although now also grown in Europe, the plant originated in South America, where it was one of the staple foods eaten by the Incas, second in fact only to the potato. There are several different ways to cook quinoa: You can boil it, for example, or puff it. Oil and flour can also be derived from quinoa. There are several different varieties of quinoa, most of which have a bitter exterior layer that can easily be removed by washing the kernels briefly in cold water. White quinoa is the most common variety, but red and black varieties are also available. 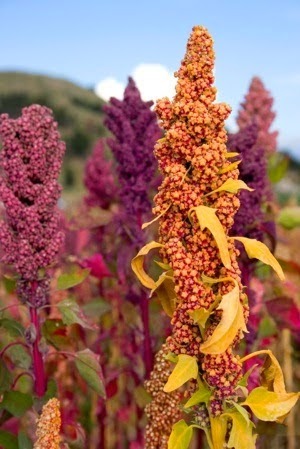 Most of the quinoa sold in Europe has been imported from Peru and Bolivia, where the indigenous population can barely afford to buy their staple food any more on account of the huge demand from the Western world and the subsequent rise in price. Looked at from this perspective, quinoa is not as sustainable a product as we would like to imagine. You can, however, buy European-grown quinoa. Gastronomixs is happy to show you a wealth of different ways to prepare quinoa! Have a look at the components chart for quinoa!